Gradualism and Addiction Treatment is a Word Press blog to share information, articles, and resources about an approach to addiction treatment that is centered on trying to create a therapeutic continuum that builds on the strengths of both the harm reduction and abstinence approaches, while trying to reduce their respective shortcomings. Dr. Scott Kellogg, PhD will add resources and articles to maintain this site. Vermont Care For All is the web home for a benefit cd produced to raise funds for the Vermont Workers Center’s Healthcare is a Human Right campaign. Sales of the benefit CD are handled by a PayPal account. Samples of all 10 tracks are available via a sidebar mp3 player. Robert Johnson Guitar Styles DVD is not a new product, but a new site. It may look familiar (see Thunder’s Mouth, below.) Guitarist Scott Ainslie loved the clean structure of his first “single-product” website and wanted to simply clone it for this one. An article by Scott will appear in the November issue of Acoustic Guitar and we wanted this new site up for the traffic the article will generate. A.L. 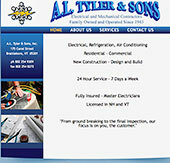 Tyler and Sons have been providing electrical, heating, ventilation and air conditioning services in the Brattleboro, Vermont area for over 40 years. This is their first website. Sari Soldiers‘ filmmaker Julie Bridgham knew she needed a site that could be kept up to date — she already had one that wasn’t! — and she liked what I had done for the filmmakers of Taking Root: The Vision of Wangari Mathaai. This site is built in Joomla! which will give Julie the tools she needs to make changes — if only her busy screening schedule allowed her time to do it! Thunder’s Mouth: CD by Scott Ainslie: Scott read an e-book on building a site that will really sell cds and decided it was worth a try. He has a site that has information on all of his cds, book and dvd, but this one is just focused on the newest cd, Thunder’s Mouth. It’s built in Joomla and has an mp3 player to serve up samples of all of the tracks. There’s lots of info about personnel, instruments, recording equipment, etc. but you’re always taken back to the main path: see, listen, buy! It seems to be working. Guilford Community Church: The Guilford Church has an active music program, youth program and things happening at the church just about every day of the year. They needed a site that could be easily updated and that could provide links to partners in their community outreach efforts. Built in Joomla! with capacity for lots of future development, the site has an events list calendar and mp3s of the choir! Will Ackerman (no relation — see that “r” in his name?) is a well known musician, producer and the founder of Windham Hill Records. His Joomla! site was designed to look a lot like his previous site, which he liked, but couldn’t maintain. The site features an image gallery slideshow on the studio page, and random quote modules.